When a customer lands on a 404 Not Found page, he or she is caught off guard – confused at best and downright frustrated and ready to shop somewhere else at worst. 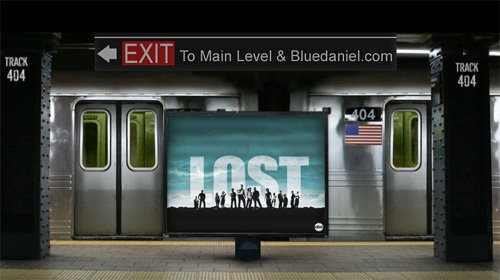 A 404 page is a customer service touchpoint. It’s an opportunity to be helpful, show a business’ personality and even merchandise. Do you treat your 404 page like a landing page? When checking out how top online retailers do 404 pages, I found many simply redirect users to the home page, which is a perfectly fine way of handling things. For those of you who do use 404 Not Found pages, here are some examples from fellow retailers — the good, the bad and the funny. When you remove all navigation it’s like teleporting a customer out of your store and dropping them into the parking lot blindfolded. This happened on many top retailer sites I tested. What a shame. 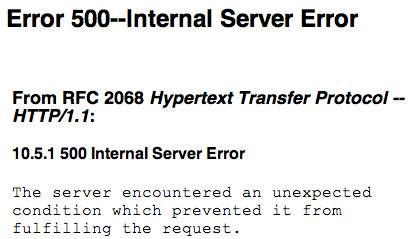 I saw lots of cold messages like this that seem to blame the user for typing in the wrong URL. But 404 messages rarely come from type-in errors, they’re usually broken links from external sites or the site itself because the root URL must match the actual URL. Customers rarely type in deep link URLs manually. But WetSeal goes a bit too far with “we’re working on this page.” Don’t imply your site is unfinished, it’s not professional. And don’t expect customers to try again later – like when, 3 months from now? eToys also leads with “you probably screwed up” (paraphrase), and adds if it was a broken link it was “probably from another site ‘cuz we never mess up” (again, paraphrase). 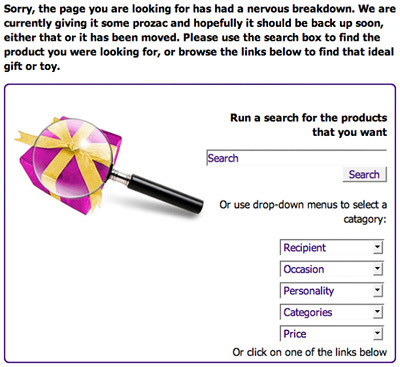 Boden is known for being a personable company, but its 404 page reads like a novel. Golfsmith uses a search box as a call to action to encourage customers to keep shopping on the site and find what they were originally looking for. But instructions on how to search like “enter a few words into the box” is unnecessary. Zappos is king of customer service, but a customer probably doesn’t want to submit a video testimonial for finding a broken link. I’m surprised Zappos, as helpful as they are, doesn’t chime in with a live help prompt. If you mention customer service, make sure you link to the customer service page. Don’t make customers have to search it out themselves. List your hours of customer service (telephone) or an estimated email response time so customers can judge whether it’s worth it to contact you or not. 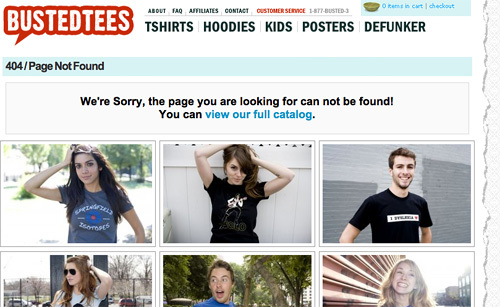 Bravo to Busted Tees for showing product on the 404 page, and linking to the catalog. If a link was from an external site (in other words, the customer may not be familiar with the product offering) this can be a compelling reason to stick around and check out the merch. I knew Urban Outfitters would do something edgy, but don’t do this unless it’s consistent with your brand’s culture and target market’s expectations of you. 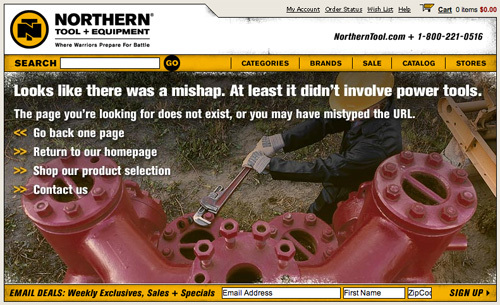 Northern Tool combines humor and usability, offering the most logical actions as links – go back one step, start from scratch, browse categories or talk to someone. I Want One of Those combines humor with search and a useful product finder. This is funny, but not because Burberry has a sense of humor – rather it’s yelling big fancy words! If something’s broken on your site, why not reward your customers for giving you a heads up? We’re busy people, and may not bother to contact customer service to let you know but an incentive could help you fix a problem that may be costing you far more than $5 in lost revenue. Plus, you could turn a comparison shopper into a buyer – now that person will hunt for something to buy to use the discount or at least visit you at a later date. If you sell higher ticket items, consider sending a higher value gift card to make it worth it. And do thank people when they take the time to alert you of broken links. I do this often and haven’t been thanked, not that I expect thanks, but an acknowledgment that a link has been fixed, at the very least, would let me know my voice was heard. This is one of the coolest “Results Not Found” page I’ve ever seen. You really have to see it to believe it – it has an interactive, microsite feel. Smashing Magazine has also collected some entertaining 404 pages worth checking out.